Our two meals programs operate daily, 365 days a year! Home Delivered Meals are taken to individuals homes by dedicated volunteers. Meals are delivered seven days a week to the homes of people that experience challenges preparing good, nutritious meals for themselves or who have difficulty getting to the grocery store. Dependable and caring volunteers deliver close to 200 meals a day. Meals are prepared in The Hub’s kitchens for homes throughout Sheridan County. The meals are delivered daily between 11:00 a.m. and 12:00 p.m. Listen to hear why Tommy and Bell from Sheridan Media enjoy delivering meals! Congregate, or meals that are served in our dining room are also offered daily. An entree and a salad/soup/sandwich bar are offered to diners. Many individuals who dine with us choose to take our Goose Creek Transit system! We serve breakfast from 7:00 a.m. – 10 a.m. and lunch from 11:00 a.m. – 1:00 p.m. We accommodate special needs diets! Contact our kitchen staff today at 672-2240 ext # 104. $5.00 for diners 60 years of age and older, and registered with The Hub. This suggested contribution includes frozen, dine-in, and home delivered meals. $5.00 for a spouse under the age of 60 if dining with a registered spouse (under 60 spouse must also be registered). 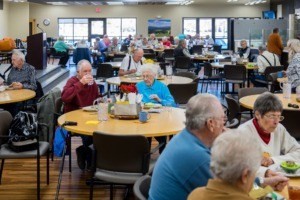 $8.00 for unregistered guests, and diners under 60 years of age. Includes frozen and dine-in meals. $3.75 for children 12 and under. Our menu is consulted upon by Georgia Boley, our Registered Dietician. She is also available various days of the week in the dining room if you have any dietary questions! You can purchase books of meal tickets at the front desk, which reduces the price of each meal! Prices are located below. $45.00 suggested contribution for Meal Ticket Books (10 tickets per book) for those individuals who are registered and 60 years of age and older. 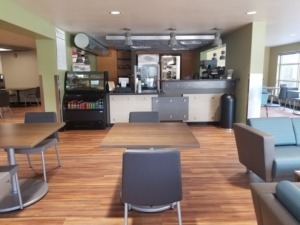 We also have a Grab ‘N’ Go Cafe available to purchase meals to take home. Served from 7 a.m. to 2:30 p.m. Mon-Fri. See all the Grab ‘N’ Go has to offer on their Facebook page! Dan Cole at (307) 672-2240 ext. 104. Call before 1:00 p.m. on Monday to let them know you would like to dine at the Story Women’s Club. 239 Creighton St., Big Horn Cross Streets: Near the intersection of Creighton St and S. 2nd St. Call before noon on Wednesday to let them know you’d like to dine at the Big Horn Women’s Club.